After a phenomenal UEFA Champions League showing against Lyon last week, Barcelona captain, Lionel Messi, continued his exploits in LaLiga as the Catalan giants faced Real Betis on Sunday night. The game saw Barcelona avenging their 3-4 loss to Real Betis last November, as goals from Messi and Luis Suarez reduced the hosts to a 1-4 defeat. Messi scored his 51st career hat-trick during the game in what was yet another display of his individual brilliance. "Our opponents suffer because of Messi, but they also enjoy him. His match tonight was extraordinary, he's scored three goals and also made a fourth." "Today was a vital match, especially after Atletico [Madrid's]'s defeat. We've taken an important step, but we have to be cautious. It's a league and we have to be careful because there is room for teams to catch up, we have to keep going." Following one of the best hat-tricks of his career, Messi was greeted with a standing ovation from the 54,000 people in the Benito Villamarin Stadium. In a moment of mutual appreciation, the crowd, consisting of Barca and Real Betis fans, were heard chanting his name in the midst of it all. "The truth is that I do not remember it [happening before]. I am grateful for the response from the fans. Whenever we come to this stadium they treat us very well, very grateful and happy for the victory, which was very important." Twitter has since exploded with reactions to the incident. By the way, that is not the first time Real Betis fans applauded Messi. Betis fans standing to give him an ovation. They’re chanting his name now in fact. If you scored 30 goals a season for 20 consecutive years, you'd retire having scored 600 goals. Lionel Messi has already scored 654 goals in 12 years and provided 295 assists. Here’s Betis fans giving him a standing ovation at their Home. Lionel Messi seals his hat trick for Barcelona at Real Betis with an absolutely filthy chip, on the run, in off the crossbar. A majestic moment from a genuine genius. Betis' fans give him a wonderful ovation, and that is all you can do. 4-1 win for Barca. 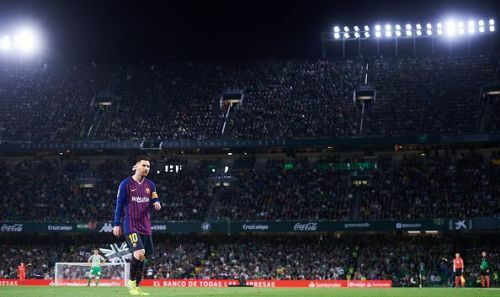 One of the best sights in football has to be the Real Betis giving Messi a standing ovation after his hat trick yesterday. He really is the greatest the world will ever see. Imagine being so ICONIC that the fans of your opponent give you a standing ovation and bowing down chanting your name.